Tour the massive mega Akshardham Temple Complex in Delhi, India and explore an amazing world of Indian culture ornate with 20, 000 statues, floral motifs, arches and exquisitely carved pillars. The magnificent Akshardham Temple in Delhi has been constructed under the patronage of the Bochasanvasi Aksharpurushottam Swaminarayan Sanstha (BAPS) and was inaugurated on November 7, 2005. The inaugural ceremony was attended by President APJ Abdul Kalam and the temple was formally inaugurated by Pramukhswami Maharaj who leads the BAPS. The temple complex in the national capital, to be inaugurated on Sunday, promises a unique glimpse of the Hindu religion and Indian culture. The Akshardham temple complex has been built on the banks of the serene River Yamuna and lies over a sprawling 100 acres of lush manicured lawns adorned with water fountains and carved pavilions. A whopping 2 billion was spent on the construction of this grand place of worship that took about 2 years to build. An IMAX theatre, a Swaminarayan temple and an elaborate musical fountain accessorize the massive Akshardham temple complex in Delhi, India. 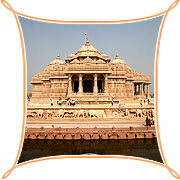 The architectural style is an imitation of the Akshardham temple in Gandhinagar, Gujarat, India. The main monument at the Akshardham temple in Delhi is about 141-foot high and houses a lovely statue of Lord Swaminarayan. Tour theme halls exhibiting tableaux depicting legends and stories that glorify non-violence and vegetarianism at the Akshardham temple complex in Delhi.